Dear guests, we would like to introduce you to the upcoming special event: “Redüttchen & Friends”. MATTHIAS PIETSCH & SVEN NÖTHEL are colleagues – but most of all friends. The young chefs both relish the idea of enjoying well-prepared food. When they stand together at the stove, it boils. It’s hot, heated and focused all at the same time. So the two of them take great pleasure in cooking together. The chefs from Redüttchen & Friends. 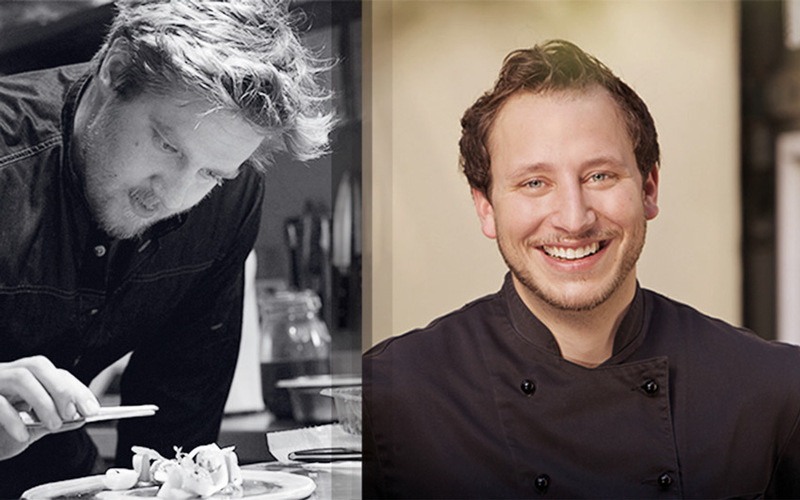 On the left side is Sven Nöthel and on the right our Redüttchen chef Matthias Pietsch. Our gourmet chefs cook with seasonal and regional ingredients of the highest quality. A relaxed atmosphere is very important to them as well as being in touch with their guests. 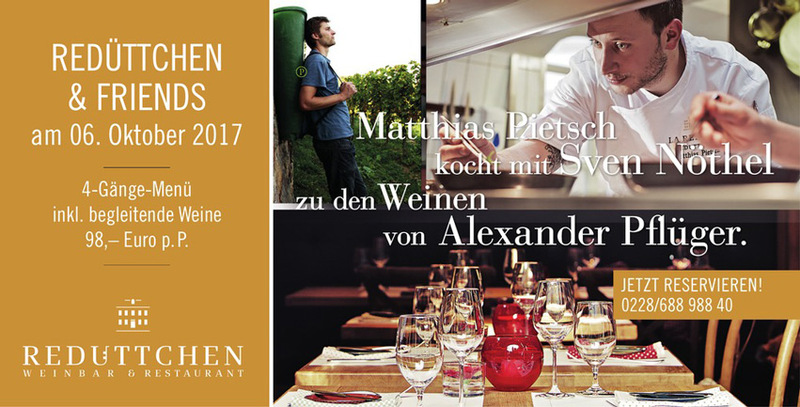 In 2016, MATTHIAS PIETSCH was invited as a guest chef by Sven Nöthel at the Mülheim restaurant “Am Kamin”. The third-generation family restaurant is praised by Gault Millau as “one of the most beautiful restaurants in the Ruhr area”. Nöthel describes his cuisine as modern – but not trendy, complex – but not complicated and as demanding yet accessible. For his efforts, he earned the award “Youngest Star Chef in NRW”. Now, Sven Nöthel comes to Bonn-Bad Godesberg for an evening in the kitchen. And you can be part of it! In a friendly atmosphere with a cozy ambience, you have the opportunity to experience the chefs and the team close-up. Each course is presented by the chefs personally at your table. Everyone has their dish prepared especially for them. Ask, experience, enjoy. A very special evening at the Redüttchen. “We aim not only to please the taste buds of our guests, but also to touch the soul”. The food should become an experience. Our dishes are paired with the wines of ALEXANDER PFLÜGER – also a young star who people are talking about and rightly so. He produces not only top wines in his Palatinate vineyard, but also harvests red grapes and reaps stars for his work. The family business dates back to the 17th century, and Alexander Pflüger is passionate about this earthbound tradition. Alexander Pflüger, a vintner with passion, shares with you his wines through the course of the evening at Redüttchen & Friends. “In my cellar, wine is not made but it is accompanied through the process.” Enjoy a conversation with the talented young winemaker and share a toast. Here you can visit the website of the winery. 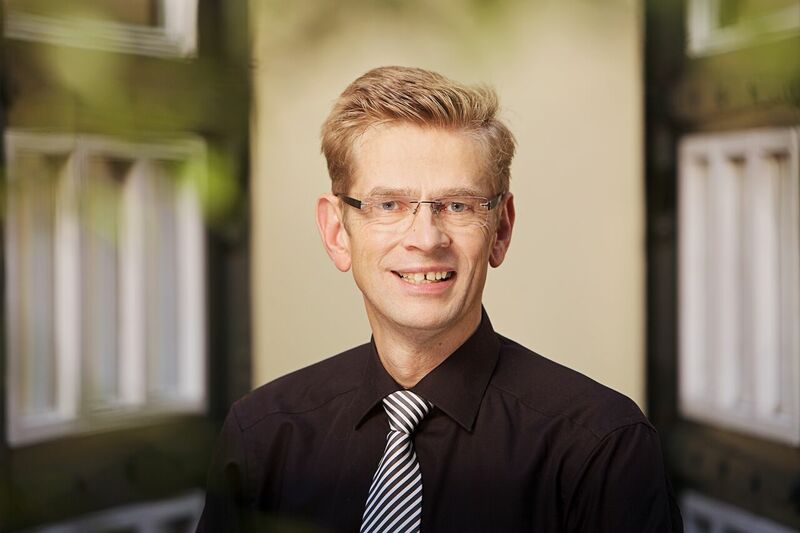 Not to be missed in our round of introductions is our host with heart, Klaus W. Sasse, who will welcome you with whole-heartedly, and take care of your every wish. You are welcome to make a reservation by calling: 0228/688 988 40 vornehmen. Zudem haben Sie die Möglichkeit. Or you can use our contact form. Greetings from the Redüttchen team.